one thing i haven't yet gotten into all that much is the fact that china started it. i think calligraphy, writing, is at the base of design. in the west the alphabet grew, over the centuries, more and more straight-lined; in the east, it grew less so. 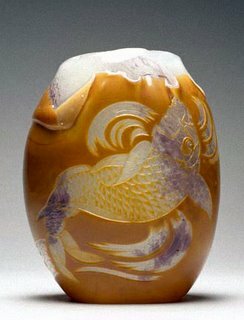 yes, japan changed the lines of the chinese arts, crafts, religion, etc. as much as did the french, for example, when the line crossed the continent. perhaps, the japanese loosened it even further, and the french found some middle-ground. well, i'm getting way off the point here. i could talk about aryan nature religions entering into china, then proceeding into japan.... in any case, and however one explains it, that is the route it took. 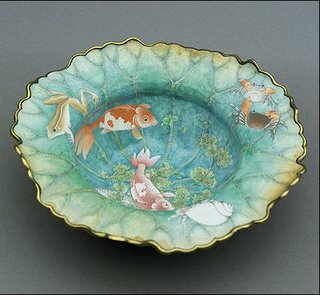 when i was in tokyo, i went to the tokyo national museum (whose website features some incredible treasures), and i saw one imari ware plate, with lotus and herons, that looked to me like "the missing link." it really did look like it was halfway between the japanese ceramics i was seeing around me, and what i'd seen of art nouveau. (sorry i can't reproduce it--the photo in my book isn't good, and the museum website seems to be down). 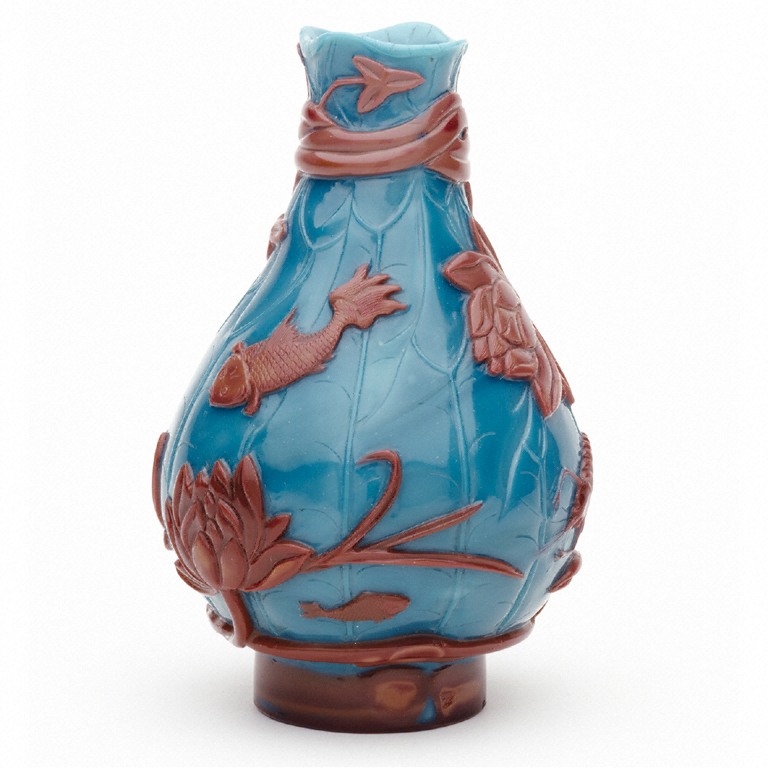 the extra- ordinary 'cameo glass' vase is about as 'art nouveau' as it gets, but doesn't it now begin to look less 'nouveau' when you see it in context? 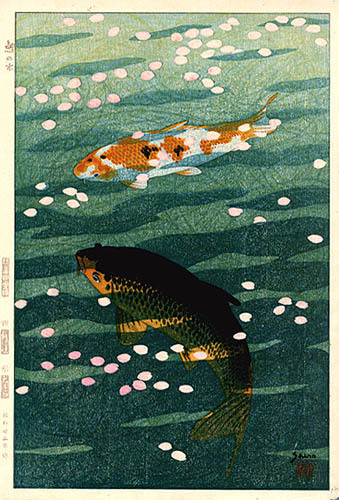 it's by eugene rousseau, and it's from about 1880.
and this one, by shiro kasamatsu, is from 1957! 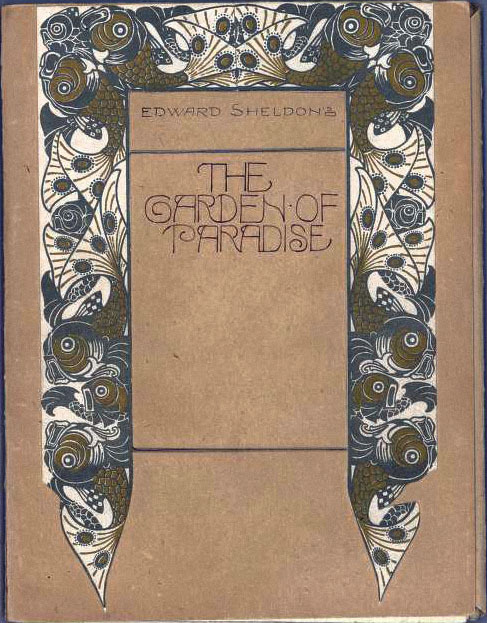 and this book is from some time in-between! and the one at the top? china. qing dynasty -- that's sometime between 1736 and 1795. As an aside, I wish more from Korea was available as well. 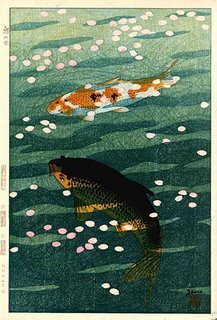 During the Heian period in Japan the best paper came from Korea and there was a lot of cross pollination between all three cultures at various times. Korea however has been the least fortunate. The influence of China on the West is longer that the Japanese but the Japanese colour and perspective could be said to have struck a powerful cord at a period seeking new expressions for modernity. The Chinese spirit is always turning towards a type of pastoral flavour or rather the poetic delight of the retired scholar. 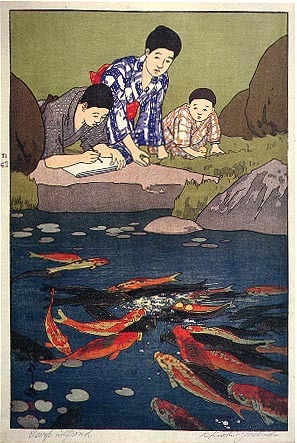 Even in the Japanese sumi-e paintings in the style of the Chinese seems to be at a distance from these subjects. Generally, Japanese art sits in a culivated garden of a man-made sophistication this would have appealed directly to the spirit of the age when it hit the West on the cusp of the modern world. interesting, florence. i'd like to hear more. 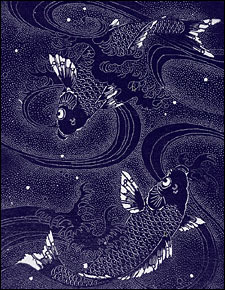 i was aware that before any of this started, china was exporting pottery, often blue and white, to the west. chinoiserie. in fact, collecting it was a major thing in the aesthetic era especially, and you'll see it showing up in a lot of the paintings i've posted, but beyond that i really know very little. i'd like to learn more about your thoughts on the pastoral spirit of china. however, i think my perception on things is different. since you used the example you did, i think it's really ironic that just last night before the tnm site went down, was looking at this! 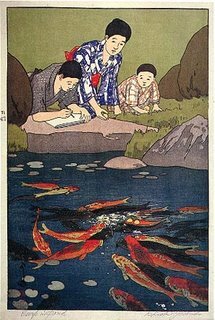 i think, and from what i've read (and not that there is not usually more than one reason), that the japanese stuff was appealing because it wasn't modern! people talk admiringly of the "unfinished" look of wood, or ceramics. they were in full revolt from the industrial revolution (even as benefiting from its inventions); this was "arts and crafts" time. so funny how differently we react! when i look at chinese brushwork it doesn't touch me at all, whereas japanese moves me deeply! oddly, i think you're right about that cusp though; i agree that eventually it was the lessons learned from the japanese that led to modern design. but as for the appeal of the japanese to the european spirit, i think for that we have two very specific men to thank.... and i'll try to get into that next.